These are the times that try sustainability professionals’ souls, particularly here in Australia. In the natural realm, two world heritage areas have suffered devastating climate-change related disasters: over 90% of the Great Barrier Reef bleached due to unusually warm water temperatures, and wildfires burned over 2% of the Tasmanian Wilderness after the hottest and driest spring on record. In the political realm, the change of federal government leadership late last year promised a bloom of environmental policy reflective of our new prime minister’s previous positions on climate change (he doesn’t deny it), carbon (he previously supported taxing it), and renewable energy (he wants to transform Australia with technology). Alas, almost no meaningful legislation or reform has been delivered, and climate change and environmental issues aren’t even a minor issue in the upcoming elections. Closest to home, and perhaps most painful of all, the Australian Sustainable Built Environment Council released a report enthusiastically titled “High Performance Buildings Open the Door to Australia’s Climate Future,” outlining the incredible potential for the Australian property sector to contribute to national carbon reduction. Of course, incredible potential to improve also means our sector’s current performance leaves much to be desired. A few charts into the report and the damning evidence is made plain; over the past ten years, all of the enthusiasm and hard work of the green building movement here has managed to drive down commercial building energy intensity by all of 2%. With floor space up almost 20% over that same time, total commercial property carbon emissions are up almost 12%. Despite all of the extraordinary energy use reductions generated by the top tier property companies, which are now public knowledge thanks to the NABERS program mandatory carbon disclosure policy, it is clear that the vast majority of property owners have failed to meaningfully reduce their buildings’ energy use. All of the best practices and industry leadership at the top of the industry has led to no industry transformation on sustainability. To paraphrase a colleague grappling with the same data: trickle down sustainability doesn’t work. Public debate in Australia is moving the focus to holistic development that prioritises social and ecological sustainability. Despite this backdrop of doom and gloom, there are reasons to be optimistic. Late last year, a ragtag rump of sustainability professionals successfully battled the Australian Building Code Board (ABCB), overturning that body’s plans to further gut the already weak national energy code. The energy renegades are now moving to the front foot and will soon be challenging the ABCB to substantially improve code in its next triennial update. In the world of sustainability benchmarking, the national church of sustainability – otherwise known as the Green Building Council of Australia – has taken a page from the Church of England and is recasting itself as a gateway organisation that embraces multiple pathways to sustainability. Former rivalries and feuds with other green development organisations have been quietly dropped, new partnerships and rating system alignment agreements have been loudly trumpeted. While the practical benefits of harmonised documentation are enticing to those of us in the design and construction trenches, the greater opportunity is for a unified front with all pushing to ratchet up codes, standards, and expectations. This could be the moment when the sustainability stick switches forward, driving building laggards up toward those leaders chasing the Green Star carrots. Another reason to be optimistic is that Australia has the courage to invest in urban infrastructure again. The number of light and heavy rail lines and tunnels, highway tunnels, airports, and brownfield precinct redevelopments is staggering to those trying to resource the projects, and exciting to the rest of us looking forward to more viable public transportation options. Also encouraging is that state governments, who are responsible for most of this development, are starting to think about development in a more sophisticated way than simply grabbing cash and handing land to private developers, which has been the prior modus operandi. Public debate about capturing infrastructure value and redirecting that into social infrastructure, and holistic development that prioritises social and ecological sustainability, has refreshed and reinvigorated a generation of planners and designers who previously spent much of their career simply face palming. With a bit of luck, and continued concerted pressure from the building professions, Australia may yet move beyond the slapdash infrastructure development practices that have been parodied so effectively – and hilariously – in the hit Australian television show “Utopia” (called “Dreamland” in its US broadcast). Atelier Ten is working at the vanguard of this enlightened practice, supporting brownfield development in Sydney that will transform an abandoned harbourside concrete parking lot into climate positive, transit-oriented development. Atelier Ten is also helping shape a regenerative community in the Gippsland Lakes region of eastern Victoria that aims to restore the local coastal ecosystem, and create an equitable, engaged community that is fed by its own renewable resource networks. Finally, despite all threats of economic slowdown and government budget cuts, Australia continues to invest in its cultural heritage. Atelier Ten is working currently on the Sydney Modern expansion of the Art Gallery of New South Wales, which will create a major new venue for contemporary art and open up access to more of the gallery’s substantial permanent collection. In a formal dialogue with the once-daylit galleries in the heritage building, the new pavilions will display art in natural light deep into the building. Across the continent in Perth, Atelier Ten is excited to begin Scheme Design work for the New Museum of Western Australia, a similarly ambitious doubling of that state’s leading cultural institute. This project is particularly exciting as it aims to showcase technologies inspired by natural and local precedent; Atelier Ten having developed many labyrinths inspired by the Barossa and Compass Termites of Western Australia, finally gets to develop one just down the road from nature’s originals! 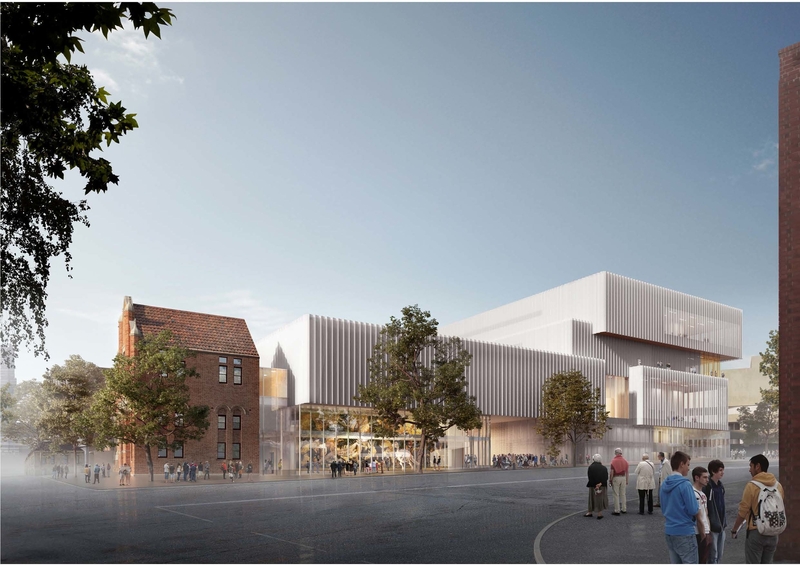 Atelier Ten will also be designing a district energy plant for the larger cultural precinct surrounding the museum, which creates an opportunity for a step-change in energy used across the entire campus. It is exactly this kind of step change in performance that our industry must achieve, everywhere, to break past the conservative property development norms and begin to approach meaningful sustainability achievement. I’m confident that Australia can do this. I’m also confident that this next decade of green building Down Under will bring about the sustainability transformation needed to meet the country’s CoP commitments and in turn protect the Reef, the Wilderness, and all of its World Heritage sites.